This infographic shows the estimated amount of moderate-to-vigorous physical activity, in minutes, that children could get from several distinct school and community policy changes. A combination of these can help kids meet the national recommendation of daily physical activity. An article summary, graphic summary table, and the full study are also available for free. This infographic can be downloaded for free in PNG format (259 KB) by clicking on the image or the "Download Original" link. A high resolution PDF version (3.18 MB) of this infographic is also available upon request. When requesting, please let us know how you intend to use the infographic. I feel very strongly that this article failed to study the most important factor in kids' activity: parenting attitudes and practices. Throughout history, kids have been most active during their time at home, out of school. That's also true today. To search for answers outside of home time with parents is a supreme waste of time. Thanks for your comment. We agree that parents and homes are a very important part of kids' physical activity. However, the focus of our work is on improving other environments, e.g. schools, parks, neighborhoods so these places can help kids be more active too. We believe that everyone has a role to play in helping kids lead healthier, more active lives. The article states that 12 minutes of physical activity can occur through modified recess (7 minutes from traditional recess plus 5 more by modifying the recess period.) Given that schools are cutting recess, wouldn't that be important to include on the infographic? Thank you for your comment. You make a good point about including the recess info on the infographic. Unfortunately, due to space limitations and not wanting to "crowd" the infographic with too many data points, we chose to leave out the finding about recess. 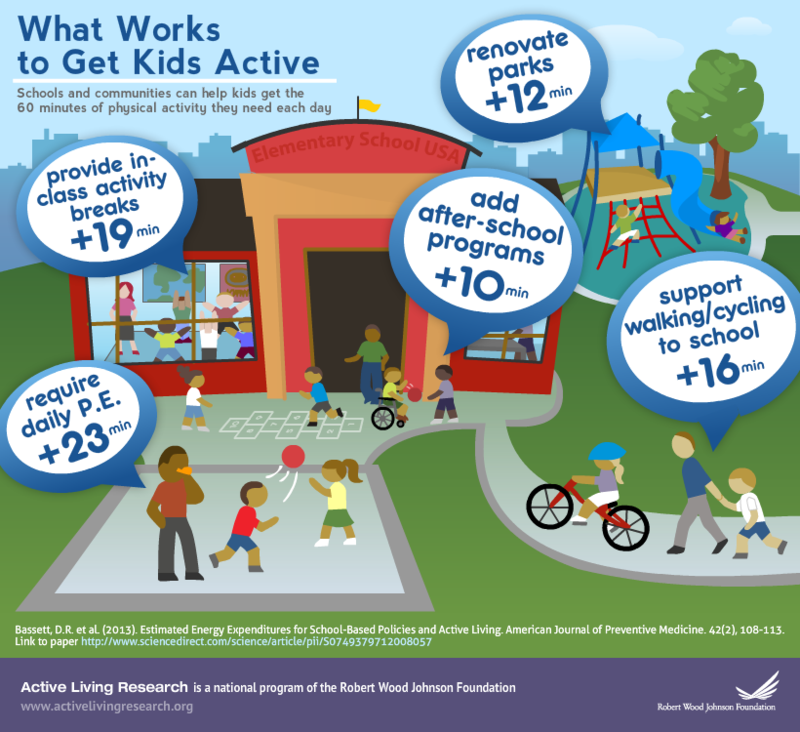 We can certainly think about using this in creating a future infographic as we certainly want more people to be aware of the potential that modifying recess environments has on getting kids to be more active. Thanks for great information. Would you please include seniors in what works. With the growing aging population, active living is crucial for keeping health care costs down as well as preventing issues from chronic diseases.